Bernie Wrightson (1948 – 2017). 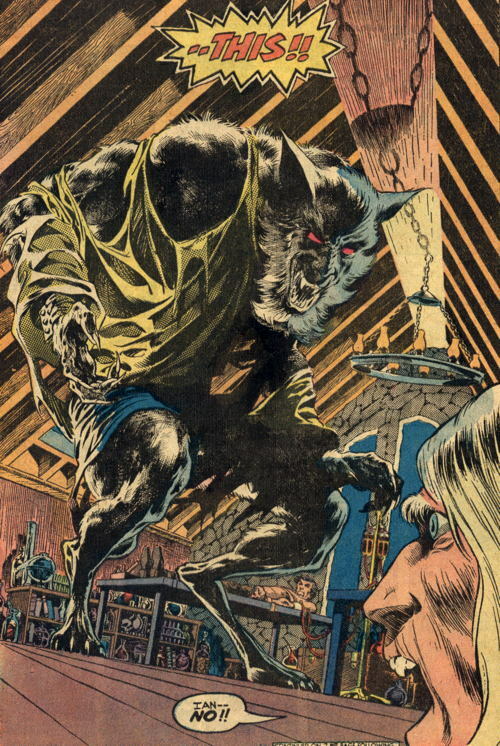 The strange perspective, the incredible detail, the full page reveal coming late in the story after we’d already seen the werewolf a couple of times…all combining to make this an image that impressed itself into my brain for all time. 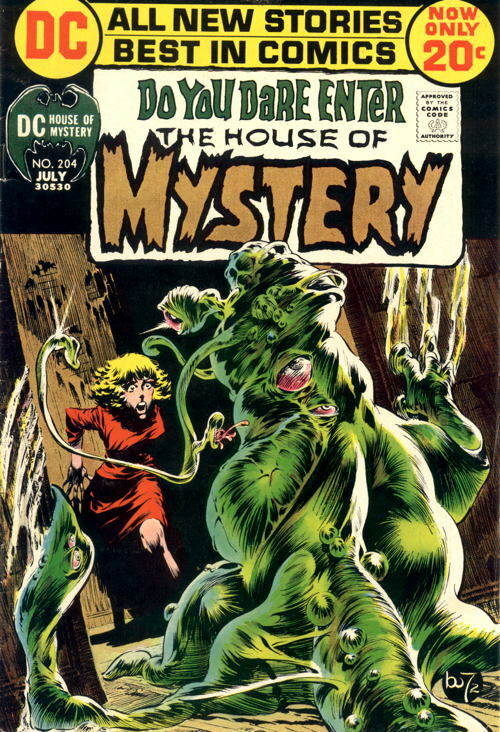 Funny that it’s a pic from this series that doesn’t even feature the title character, but this splash from #1 does take a close second in the “Bernie Wrightson Drawings I Think of When I Think of Swamp Thing” category. But flip through pretty much any issue of Wrightson’s Swamp Thing and you’ll see no end of intricately-detailed illustrations, their impact diminished not at all by the cheap printing and yellowing paper. If anything, the impact is enhanced, the drawings made even more moody and mysterious by the decaying pulp on which they are presented. And this doesn’t even scratch the surface of the man’s work. These drawings are all from the early years of his career…his impossibly-detailed Frankenstein work was still ahead of him. His “Captain Sternn” stories, both the short in Heavy Metal and the later mini-series (plus the related back-ups in Dreadstar . The Weird . Batman: The Cult . National Lampoon strips and illustrations. Tons of horror shorts for Warren magazines. The Hulk/Thing graphic novel. Batman/Aliens . The “Howard the Duck for President” button. The Spider-Man: Hooky graphic novel. The comics adaptation of Stephen King’s Creepshow , plus all the other illustrations he provided for King’s novels. Even Punisher comics…and much more, besides. Saying “he was a great talent and he will be missed” doesn’t seem like enough. He embodied a particular aesthetic that took inspiration from horror comic artists and fantasy illustrators that preceded him, and formed it into something unique, something so his own that the term “Wrightson-esque” easily conveys its meaning. He didn’t just redefine the horror genre. He was his own genre. So long, Bernie. Thanks for letting us see, for so many years, what your wonderful imagination created. 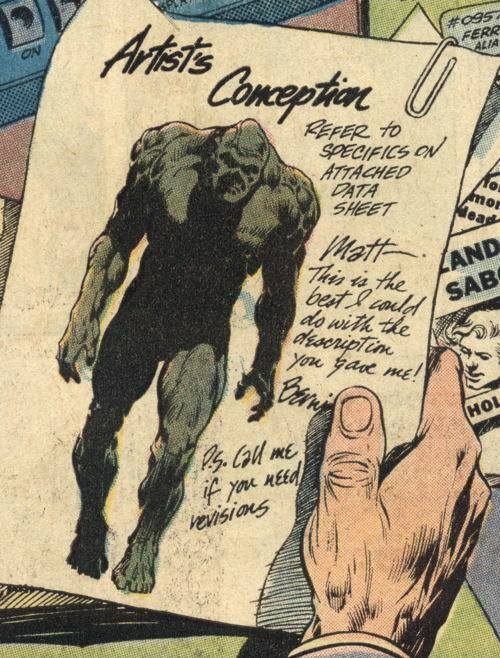 And you didn’t think I was going to let this go without at least one picture of Swamp Thing, did you? I first saw that image in a comic lying around in a friend of a friend of the family’s home, circa 1977? I remain terrified of werewolves to this day. Godspeed, Mr. Wrightson. May a host of Protean angels sing you to your rest. I don’ think I’ve ever personally witnessed such a near unanimous outpouring of loss/respect for a comic artist’s passing as I’ve seen the last several days for Wrightson. And I’m so grateful for that. Sounds like he was as great a man as he was an artist. 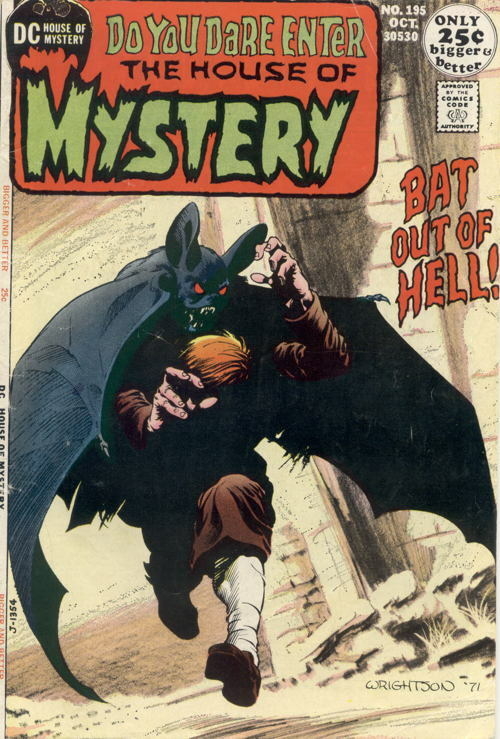 I must admit, my exposure to Bernie Wrightson’s art is pretty limited (the first place I can ever remember seeing his illustrations is in “Cycle of the Werewolf”, and the only comic book art I have by him is any issue advertising “Hooky” and the contribution to “Heroes For Hope” that always made me uncomfortable), but that “Bat Out of Hell” cover is pretty amazing. I like everything Batman that he did. I didn’t know he’d passed on. Thanks for sharing.